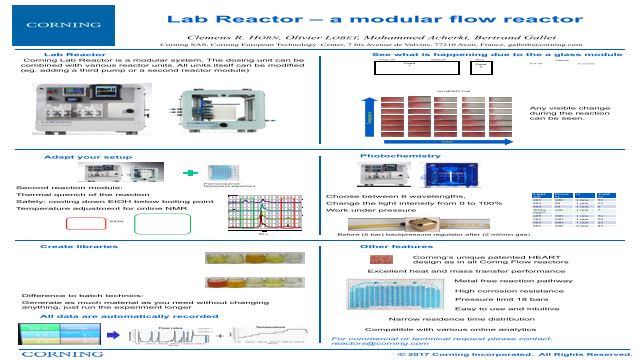 Abstract: The flow chemistry and microreactor technologies have proven to be an innovative tool to achieve new chemical path synthesis, improving safety and increasing yield and, conversion . The possibility to scale-up the reactions for the industrial production increases the need to screen synthesis in a robust way . Corning has developed a versatile and easy to use microreactor for the laboratory, the Lab Reactor, keeping in mind the possibility to scale-up the process.